One of the darkest classes of the Tuatha Dé Danann, Morrigans feed off the death around them. Their strongest associations are with crows, wolves, and cows. 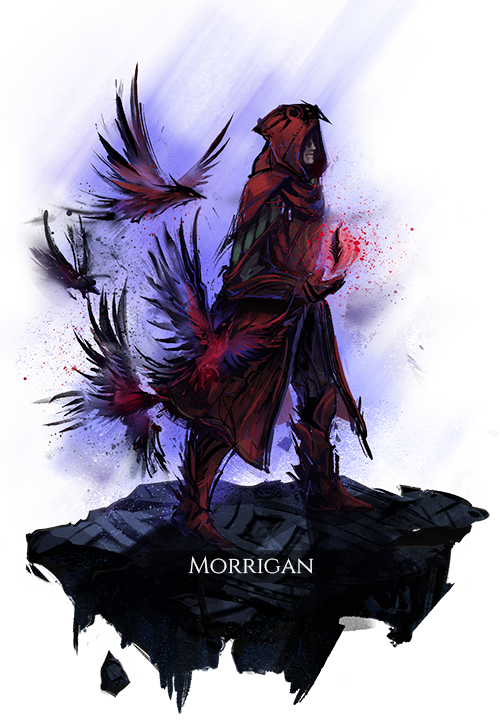 Morrigans have the ability to change the spirits they control into other spirits. The original Morrigan was a Bean Sidhe who learned how to control the spirits of the dead. For this, she earned the moniker Phantom Queen. A fast-moving pet that tears at the target, dealing slashing damage. Crows gain a spirit buff that provides increased movement speed and health stealing, when penetrating the target’s armor for each additional crow beyond the first that attacks the same target. A large pet with high health that slams the target, dealing high disruption damage. Bulls gain a spirit buff that shares the damage they take between each bull present. Summons a spectral pet at the location of the caster that travels directly toward the target, affecting any other targets it passes through along the way. Creates a portal to the current location of a target, projecting a short duration spectral pet through the portal to the target’s location. Summons a number of spectral crows that fly toward nearby enemy players, attacking them and causing a high amount of panic. Provides a spirit buff to nearby allies, infusing them with the power of a spectral bull which increases their damage with weapon attacks by an amount spread among the allied players present. Also applies a spirit debuff to nearby enemies, afflicting them with a swarm of spectral crows, reducing their physical damage mitigation by an amount based on the number of enemy players present.